If you're looking for a way to indulge in a scoop at breakfast, this recipe is not that. But if you want to celebrate National Ice Cream for Breakfast Day without actually licking some cold stuff, you can have this bread pudding instead. 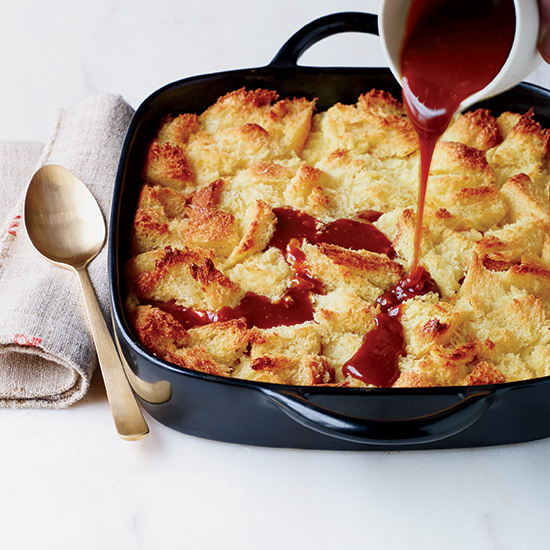 This genius bread pudding is made with melted vanilla ice cream, eliminating the need to make a custard. Here, a fantastic make-ahead Thanksgiving dessert that does double duty. Since Thanksgiving is often just the kickoff for a weekend filled with family, friends and festivities, it's a boon to be able to maximize any cooking you've done so you don't miss out on any of the fun. Whenever I've made this awesome pumpkin-brioche bread pudding with caramel rum raisin sauce, I stash the baking dish in the back of the fridge hoping no one will find it. Then on Saturday or Sunday morning, I pull it out, cut the cold, firm pudding into squares and bake them until piping hot. With a drizzle of pure maple syrup or heated leftover caramel-raisin sauce, you've got the easiest and best breakfast to ring in the holiday season.